This entry was posted in Uncategorized and tagged Cinquain, hudson valley ny, Inner Peace, Mental Well Being, peace, poem, poetry on November 25, 2016 by The Zen Hiker. The sign at the entrance to the parking lot. I’m pretty sure that it’s been over ten years since I did any kind of hike in the Black Rock Forest. Since today was another one of those rare cool mornings in August, I decided to do a loop that would take me over trails and woods roads to places that I have never hiked before. Parking was easily found just off of Route 9W. Starting on the Duggan Trail, the trail quickly descends through some pretty thick woods that had some interesting rock walls and large rocks as stepping-stones. After following the red blazes for about a half of a mile, the trail ends and intersects with the blue blazed Reservoir Trail. Since this hike is a loop, you will encounter this trail again, this time going uphill. Crossing a woods road, you immediately come upon Ben’s Bridge, which will take you across a small stream. A closer look at Ben’s Bridge. After crossing the stream, the trail, at this point very rocky with a lot of loose dirt, begins a steep and winding climb that parallels the stream. The trail here was pretty cool because at times it was closed in and you got a feeling as though you were wrapped in a lush blanket of summery goodness. Apparently the reservoirs in the Black Rock Forest still supply water to the local communities and this is one of the pipes that accomplishes that. Directly across from the pipe is this awesome sign that not only tells you what trail you are on, it also lets you know what is coming up on the trail. If only all signs on all of the trails in the area were this detailed!!! After resting for a few minutes, drinking some water and tightening my boot laces, I threw my pack on and made the right turn up the Honey Hill Trail. This trail also weaved through the woods and after just coming off of the Reservoir Trail it to proved to be a pretty steep climb. Based on all of the write ups I read preparing for this hike, I thought that a nice view was awaiting me when I reached the top! Hmm…I’m thinking that maybe the folks that wrote about the views on Honey Hill did so in the fall or winter because when I got to the top, this is all I saw. If the trees were bare I do believe that the view would have been much better than it was today. Since I didn’t have t any type of view, I immediately headed down the trail. Be careful here because it is very steep and the terrain mirrors what you have already been hiking on-loose rocks and dirt! Be mindful and watch your footing as you make your way down this section of the trail because the drop off to the right could prove to be treacherous if you slipped and fell! For our hike, keep heading to the left down towards Aleck Meadow. Steps on the descent from Honey Hill. I have to admit that the first thing I thought when I saw this tree was Blair Witch Project. If I had been hiking close to sunset I probably would have started running. Good thing it very early in the morning!! Staying on the trail, you either descend or stay level for another fifteen or so minutes. As you continue hiking, the sound of running water becomes louder and louder and after rounding a corner, you are presented with this stunning view. Due to recent storms that had passed through the area just two days before this hike, water was actually flowing over the dam. Based on the time of year, I had fully expected it to be dry. This made up for my Blair Witch like scare just minutes before! The trail continues right to left over the spillway on the Stillman Trail. The Stillman Trail after crossing the spillway. I had first decided to make the trek to Black Rock Mountain but after looking at the map I thought it would be cool to venture instead to the White Oak Tree. The tree, conveniently located not to far along on the White Oak Road, was worth the diversion that I had decided to take. How often do you see a huge tree that sits in the middle of a road? You can sit and rest at the White Oak Tree on this bench. 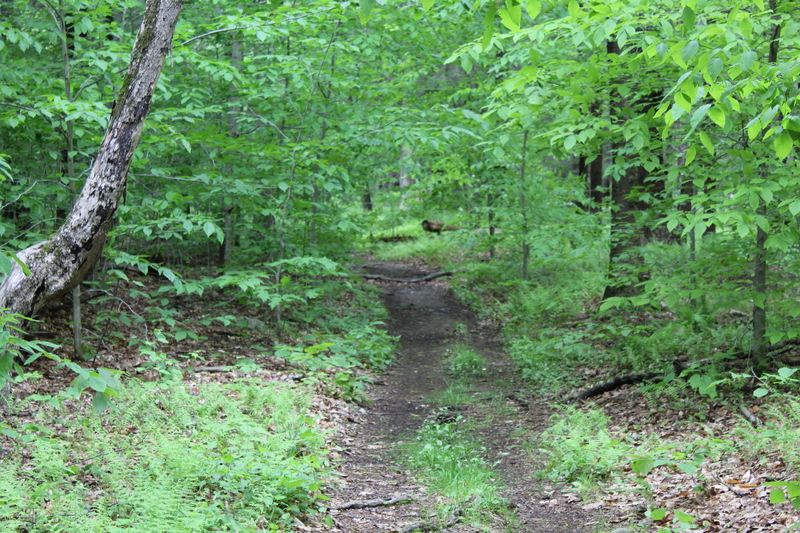 You will follow this woods road for almost four tenths of a mile where the Continental Road continues straight. Directly to the right, you will see the entrance to the Hulse Road. Continue on this road for the 1.4 miles. As soon as you round the corner in the picture below, you will start to descend rapidly through the forest. At times the descent is very steep so you need to be very careful, the trail here is also very rocky and if you aren’t paying attention you could easily twist an ankle. After completing the 1.4 mile downhill extravaganza, you will find yourself on the blue blazed Reservoir Trail again. The trail starts moving uphill again, but not at the same rate as the downhill you just completed. Two tenths of a mile after rejoining the trail, you make a left hand turn and you are back on the Duggan Trail. Stay on this for a half of a mile and you are back to where you started! This small building was just off of the Reservoir Trail after leaving the Hulse Road. Even though I didn’t get the view I was expecting from Honey Hill and also bypassed Black Rock Mountain, I did get to see the Dam, Aleck Meadow Reservoir and the White Oak Tree. They all proved to be interesting in their own unique ways and I’m glad that I got some pictures on what was a beautiful day. I would love to see the dam when the reservoir is cascading over the top at it fullest and head up Honey Hill when the trees aren’t fully obscuring what I am sure is a magnificent view! It looks like I may be doing this hike a few more times this year to see what I can see. Another excellent hike!!! This entry was posted in Uncategorized and tagged Aleck Meadow Reservoir, Black Rock Forest, Black Rock Forest Consortium, Blog, Blogging, Calm, Hike, Hiking, Hiking Photographs, Honey Hill, Hudson Valley Hikes, Hudson Valley Hiking, John Muir, meditation, Mental Well Being, Nature, Nature Photography, NY/NJ Trail Conference, peace, Photography, Summer hikes, Upper Hudson Valley, White Oak Tree, word press on August 30, 2016 by The Zen Hiker. This entry was posted in Uncategorized and tagged autumn, Blog, Blogging, Calm, fall, Haiku, Mental Well Being, peace, poetry on August 26, 2016 by The Zen Hiker. This entry was posted in Uncategorized and tagged Affirmation, Blog, Blogging, Calm, Javier Micard Teixeira, Jerris Madison, Mental Well Being, peace, self help on August 23, 2016 by The Zen Hiker. This is an FYI for my readers-The Joseph’s Star, a poetry form created by Christina R Jussaume on 08/06/07 in memory of her Dad. This poem has no rhyme, and is written according to syllable counts. Syllables are 1, 3, 5, 7, 7, 5, 3, and 1. The poem may be written on any subject, be center aligned, has no stanza limit, and should have complete statements in each line. This entry was posted in Uncategorized and tagged Blog, Blogging, Calm, Christina R. Jussaume, Hiking, Hudson Valley Hikes, Hudson Valley Hiking, Mental Well Being, peace, poetry, The Joseph's Star on August 21, 2016 by The Zen Hiker.